It’s a common conundrum: You’ve always been a size 8, so why do you find yourself barely squeezing into size 12 jeans at one store and swimming in a size small sweater at the boutique down the block? Whether shopping online or in-store, many of us have experienced the frustration of inconsistent sizing across brands and styles. American women today average 168.5 lbs. (up from 140 lbs. in 1960), according to recent research, with an average size of 16 to 18. And yet despite our overall increase in body size, clothing labels are getting smaller—a modern waist size 0 is comparable to a size 12 in 1970. When clothes run larger in actual measurements than their tag implies, it’s often called “vanity sizing,” since a shopper can feel like their body is smaller than it may actually be. But sizing data collected by thredUP shows that vanity sizing may not be intentional—overall, brands are just as likely to undersize clothing as they are to oversize. *Average size refers to the thredUP sample average. See the Methodology section for more information. As the world’s largest online thrift store, thredUP receives thousands of clothing items each day, sorts through each and every piece, and lists over 30,000 items on our site every day. Customers can shop their favorite brands at up to 90 percent off or request a Clean Out Bag and sell their gently used and like-new items. With over 41,000 brands in our database, we examined over 12,000 of America’s most popular clothing brands and analyzed 287 unique brands in detail. Through this revealing data combined with insight from style experts, we’ll show you how to look past the labels to find your perfect fit. thredUP manually measures every piece of clothing that is sent in by sellers. For this study, we compared the measurements of all available sizes for over 2.5 million items of clothing—including tops, dresses and jeans—to determine average sizes. By comparing each piece of clothing to the average overall measurements, we were able to determine which brands vary from average sizing the most. thredUP’s study found that 32 percent of the 59 jeans brands we reviewed ran at least a quarter inch larger around the waist than the average measurement for the label size. That might sound like vanity sizing, if it weren’t for the 41 percent of brands that ran at least a quarter of an inch smaller. Likewise, 19 percent of dress brands ran at least half an inch larger around the chest, versus 26 percent running smaller. For tops, 33 percent of brands were larger than average, while 32 percent ran smaller. To illustrate just how much variability in sizing we see across different brands, we charted brands whose actual sizes differ from the label size across two popular clothing categories: dresses and jeans. *See the Methodology section for more detail on these numbers. *Average inseam across all the jeans was 29.81 inches. You can use these charts to guide your size choices across popular brands. And if you see a brand with a fit you love, there’s a good chance you’ll be happy with other brands’ fits in the same category. While sizes naturally differ widely between brands, some brands actually show huge discrepancies between their own sizes, too. These are some of the brands that are most inconsistent in their sizing across all three categories—jeans, dresses and tops. We measured and analyzed over 250 dresses brands, 55 tops brands and 55 jeans brands, and calculated each brands’ respective minimum and maximum measurements from the average. We found that there are some brands that measure drastically different within themselves. Some brands’ minimum number of inches and maximum number of inches for each category create wide ranges. 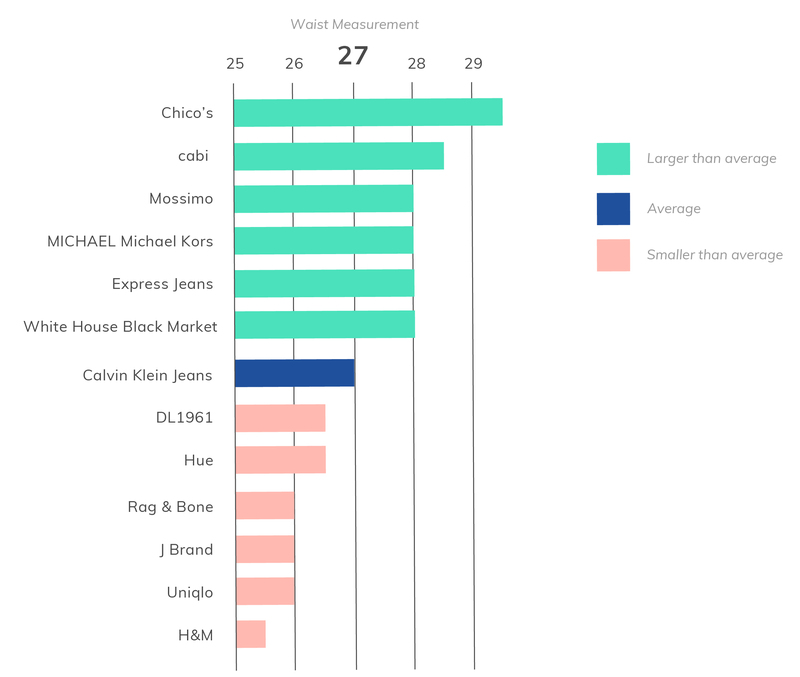 These brands exhibited the largest ranges of measurements (from .75 inches to 3.25 inches) for tops, dresses and jeans. *Based on bust measurements for tops and dresses and waist measurements for jeans. See the Methodology section for more detail on these numbers. Shopper’s tip: Be sure to check the measurements of these brands before choosing a size, especially if you’re buying online. When inconsistent sizing becomes an issue for customers, it’s up to the brands to reevaluate their methods. 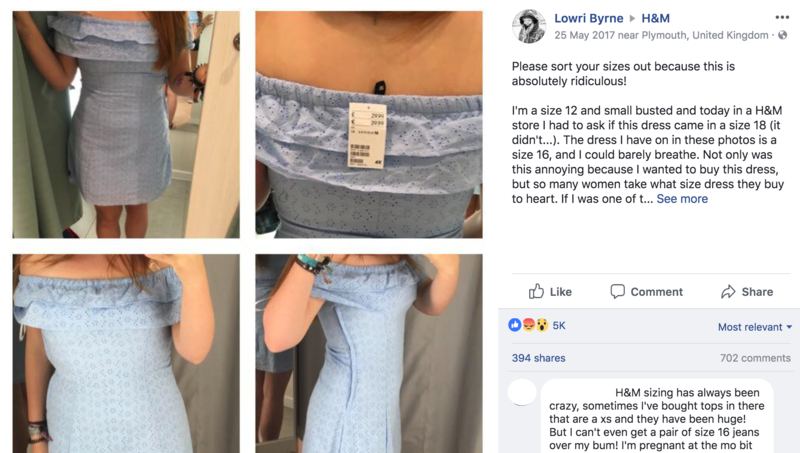 After a UK customer’s Facebook post about needing to size up three sizes in an H&M dress went viral, the Swedish retailer is adjusting their sizing standards to make them truer to label size. In a recent interview with Racked, an H&M spokesperson said, “We knew from feedback that our sizing needed to be more in line with the North American consumer as well as be in line with the industry standard in the market.” As of late 2017, they’ve begun rolling out larger sizes. But it looks like they may have been experimenting with size changes well before that. After measuring and analyzing over 100,000 items of H&M clothing, our data found that H&M pants have been consistently getting bigger since September of 2017. H&M tops also began getting larger after September 2017, and dresses began to see a small increase starting in January of 2018. This may show that customers may have more pull over brands than they realize and, thanks to social media, are better equipped to effect change. Overall, it appears that H&M’s clothing is consistently getting larger—though while their bottoms and tops have increased in size over time, they’re still running smaller than average. H&M’s dresses, on the other hand, were found to run big and saw minimal sizing changes. Yet, even within the same brand, there are sizing inconsistencies. H&M’s house brands L.O.G.G., which has a more relaxed fit, and Divided, which is a juniors’ line, both vary greatly in their sizing standards. For example, H&M tops with letter sizes (like XS, S and M) are all getting bigger – but not in a consistent way. The Divided tops increased by 2.14 inches, while the L.O.G.G. tops increased by 1.91 inches. H&M’s main line increased by 1.24 inches. Making their sizing more inclusive is a step in the right direction, but without a clear formula to go by, customers looking for a true-to-size fit may still wind up frustrated with H&M’s sizing. We can’t deny, many of us feel a sense of satisfaction when we fit into a smaller size than we typically wear. Maybe you’ve lost weight …or it could just be that you’re trying out a new brand. Our data reveals that there are certain brands whose clothing consistently runs larger than their labels suggest. If you buy a dress from Madewell, for instance, its chest measurements may be a whopping 3 inches bigger than the chest of a dress from Splendid, which sizes closer to the average measurements for its label size. 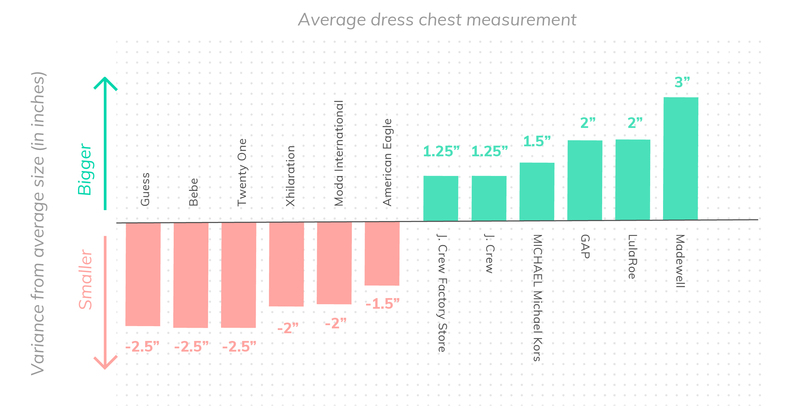 LuLaRoe and Gap also tend to measure close to or more than 2 inches larger in chest measurements for dresses, while brands like Chico’s, Michael Kors, J. Crew Factory Store and Liz Claiborne have consistently larger chest sizes for tops than their labels suggest. *Based on chest measurements. See the Methodology section for more detail on these numbers. A Classic Example of Vanity Sizing or Target Marketing at Play? If a brand manipulates their clothing labels and, as a result, consumers feel better about themselves and what they’re buying, they may be more likely to return for more—at least, that’s the hope. Often, it results in even more frustration for shoppers trying to find their size. Others argue that vanity sizing isn’t the best explanation for the common size discrepancies. According to Kathleen Fasanella’s book, The Entrepreneur’s Guide to Sewn Product Manufacturing, it all starts with brands determining their target market and then determining what size is at the middle range of that demographic. A size medium can be developed based on a fit model, and from there additional sizes are created algorithmically—though the further you get from “medium”, the greater room for error. Medium is generally the most commonly sold size for any brand. When a larger size starts outselling a medium (or the other way around), that size then becomes medium and other sizes are adjusted. It’s all about keeping up with demand—which, for these brands, means smaller clothes for an often younger, value-minded consumer base. As a result of such target market sizing in clothing, some brands’ labels run smaller than their measured sizes while others run bigger. In other words, you could buy a size large that fits like a small. If you buy a dress at Bebe, for instance, it will likely measure 2.5 inches smaller than the average size chest measurement across thredUP’s reviewed brands. Twenty One, Moda International and XXI also measure 2 or more inches less than the average chest measurements in thredUP’s inventory. Jeans from brands like H&M, J. Brand, Zara and Forever 21 run half-an-inch or smaller than the average waist size (H&M being the smallest at an average of 1.5 inches smaller). For tops, brands like American Eagle, Xhilaration and BCBG all tend to have bigger labels for smaller-fitting clothes. These brands commonly use larger-than-average size labels for dresses, according to data collected by thredUP. One thing is for certain: clothing labels rarely reflect their actual measurements. The good news is that some brands consistently stick to labels that are in line with consumers’ actual sizes. When it comes to dresses, BCBG, Kensie and Mossimo are known for giving shoppers what they expect. For jeans, American Eagle Outfitters and Calvin Klein Jeans run closest to the average jean waist size. And for tops, J. Crew, Talbots and Apt. 9 all stick close to average measurement sizes. 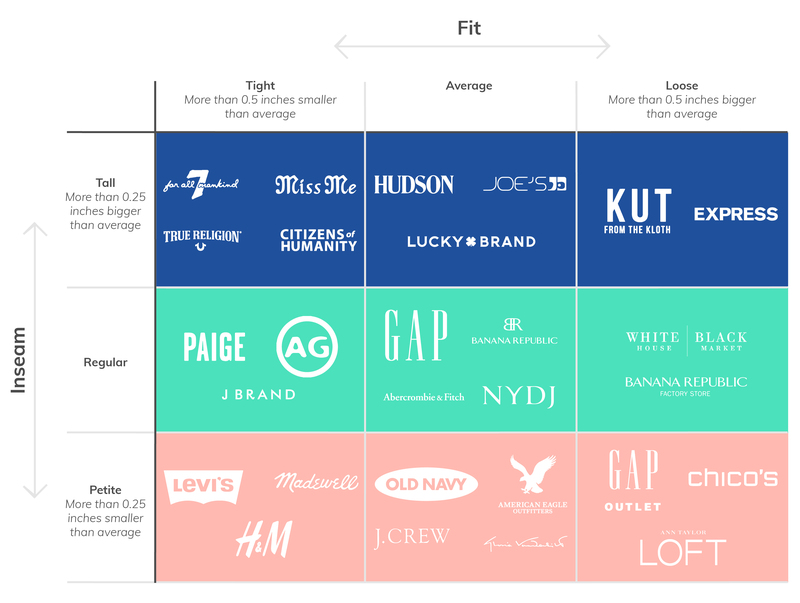 These are the brands that are most consistently sizing closest to the average size that is reflected on labels for jeans, dresses and tops, according to data collected by thredUP. *Based on waist measurements for jeans and chest measurements for dresses and tops. See the Methodology section for more detail on these numbers. It started out as expanded sizes for “stout” women in the early 20th century. Then there was the “plus-size” section, often with limited options, squeezed into a corner of the store. Today, research shows that plus-size apparel sales skyrocketed to $21.4 billion last year. Savvy retailers recognize the value of this rapidly growing market, and women who wear size 16 and up are demanding more options. Online retailers especially are offering expanded sizes to shoppers who deserve to be treated like more than an afterthought. While some companies are rebranding their plus-size section (Kmart famously changed theirs to “Fabulously Sized”), others are doing away with the plus-size section entirely, grouping all clothing together in one section—for all shoppers, no matter what their size. The argument: Why should some shoppers be relegated to a separate section based on their size? Expanding sizes can be surprisingly complicated for designers. While one clothing pattern is used to create more “standard” sizes such as 0-12, a second prototype must be used for larger sizes. This requires brands to leverage additional planning and labor. Even then, clothing may require alterations to achieve a perfect fit on an actual body—plus-size or not. “When shopping, it’s important to understand that clothes are fit on a model before they make it to market, so often the model that is used is 5’10” and a perfect size 18,” blogger Marcy Guevara says. “If you’re not 5’10” (which most of us aren’t), you should understand that sleeves and hems will most likely always need alterations. Whether shopping online or in a store, our style experts offer these four pro tips to help you find your perfect fit. For this study, we looked at three categories of clothing: jeans, dresses and tops. For the size comparisons discussed in this study, we used the waist and inseam measurements for jeans, and the chest and length measurements for tops and dresses. thredUP manually measures every piece of clothing that is sent in by sellers. Shrinkage and stretching were not taken into consideration. An average measurement was calculated for each size using the manual measurements to get the average of the total sample. Each item and brand’s average size measurement was calculated by taking all the items of a particular brand in a specific size and finding the average of those measurements. For example, we took all the Levi’s jeans with the label size 26 and calculated the average waist measurement for that sample. From these average measurements, we compared the brands across each labeled size and the average manual measurement and identified whether a brand runs close to the average size, smaller than the average, or larger than the average for each size. Looking at the average measurements compared to the average overall measurements, we were able to determine which brands had the most inconsistent sizing. For this chart, the baseline (“0”) represents a cumulated sample average dress size. The value shown for each brand is the average difference from all sizes analyzed for that brand. For example, if a brand’s size extra small was 0.6 inches larger, size small was 1.1 inches smaller, size medium was 1.1 inches smaller, and size large was 1.5 inches smaller, we took the average of those differences (which comes to 0.78 inches) to determine the brand measures .78 inches smaller on average. This view shows across all sizes how a brand’s average measurements compare to the sample average. We looked to see if they were looser, tighter or true to size in comparison to the sample average. To determine the sample average, every item in each size was measured individually. We then calculated the average for each size by taking an average of those measurements. For example, we measured the chest of size small dresses and got a sample average of 30.4 inches for the chest. We then looked at every brand that has a significant number (100+) of size small dresses sold and took an average of the chest sizes for those dresses. For example, Forever 21’s average came to 29.3 inches. We then compared Forever 21’s average to the sample average of 30.4 inches. Forever 21 had a 1.1-inch difference, so they would be considered to run smaller. We then repeated this process across all sizes to get a difference for each brand compared to the average. In this sample, we found each brand’s average difference for sizes extra–small through extra–large. On the graph, “0” represents a cumulated sample average. The value shown for each brand on the graph is the average difference from all sizes analyzed for that brand. For example, if a brand’s size extra small was .6 inches larger, size small was 1.1 inches smaller, size medium was 1.1 inches smaller, and size large was 1.5 inches smaller, we took the average of those differences (which comes to .78 inches) to determine the brand measures .78 inches smaller on average. This analysis allows us to say that on average, each brand runs X inches larger or smaller than the average across all sizes.